Day tickets are available throughout the year at Exe Valley Fishery. We offer very competitive rates (especially considering the size of Trout that we stock!) and there is no need to book. Permits can be purchased when the main reception is open using cards or cash, usually between the hours of 8.00am & 6.00pm. There is also a self service permit option on a cash only basis and if you would like to enjoy an early morning or into the evening please call 01398 323008 or email here to organise. For the lucky angler in your life! Anchor Lake 2019 Permit Pricing: We are continuing to hold our 2017 prices for 2019. After receiving several requests from anglers we are trialling a 1 fish permit until the end of March 2019 to see if it becomes a permanent permit option. This permit will also include the very popular Catch & Release Option (subject to specific rules & terms) - improving our value for money even further. To find out more about this new facility available on Anchor Lake please see the catch reports area news feature Exe Valley introduces Catch & Release Permit Options. 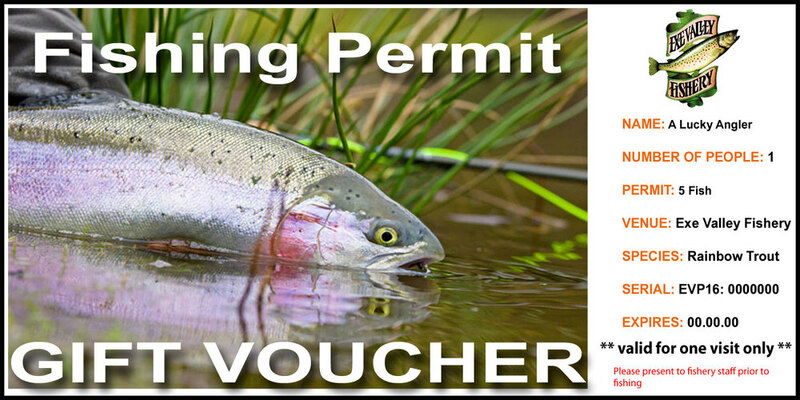 Permits are valid for one session only and must be purchased prior to fishing. Parent & Child Permit: Pay the standard adult permit fee as shown above and a child may share the bag limit. Please note that only one child per full paying adult may share a ticket. The age limit for this offer is 14 years old and under. Cash Payment: We advise anglers to arrive with cash including £10 notes, £5 notes and £1 coins which will enable them to pay for our permits as listed above in the event that the shop is closed, using the self serve facility (see further info below). Card Payment: We are happy to process card payments when the shop is open. However we do not guarantee that the shop will be open during fishery hours, therefore please also visit with cash as described above. Nearest cash point is Dulverton. Pre Paid Permit Voucher: Can be purchased over the phone by Visa or Mastercard. PayPal & BACS payment can also be processed. Payment Methods we do not accept: Cheque payment is not available. Permit Rules: We strive to operate a friendly fishery. Our rules have been kept to a minimum and are as simple as possible. These rules are in place to ensure no misunderstandings or unnecessary embarrassment. Here is a simple check list showing our main conditions regarding the issue of Exe Valley Fishery Permits. Anglers enjoying Merry Christmas catches at Exe Valley Fishery!